A few days ago some Greenlandic hunters and families arrived by dog sled from Qaanaaq to the north and Savigsivik to the south. It took them four days to get here. Along the way they hunted polar bear and muskoxen. We hear that over at Dundas Village, there are heads and skins from the hunt. I sure wish a polar bear would wander by here for us to view. 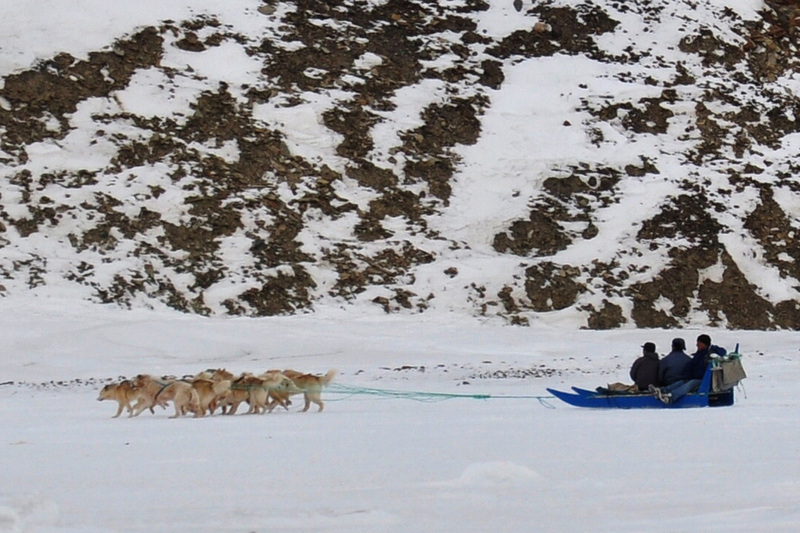 There are a dozen or more dog teams gathered about the sea ice here near the base. They are here for the First Light Festival which has been celebrated in Thule for years. Then, next Saturday is Armed Forces Day. Dog sled races will be held on the sea ice. One can actually enter a drawing to ride along in one of the hunter’s sleds during a race. Prizes will be given away. I am not sure what all the prizes are, but one is a rifle. I see some new faces around town--hunters and some Greenlandic women and children. It is wonderful to see kids around. The Greenlandic sled dogs are called Eskimo dogs and they are beautiful. Some of the dog’s guard hairs and hackles are like none I have ever seen. The hairs are long, wavy and multicolored. Some dogs have these long guard hairs or hackles covering almost their entire body. The dogs seem less excitable than the Alaska huskies which I am used to and they seem more socialized around humans. While we were alone with the dogs, they barely took notice of us. When a hunter came walking over from the village (about two miles away) the dogs perked up and took notice of him even when he was as far out as 100 yards. The Greenlandic government has recognized that the Eskimo dog breed is rare outside of Greenland. Because the Greenlandic government does not want their dog line to have outside influence, they rarely permit foreign dogs entry to Thule. People began living at Dundas over 900 years ago. 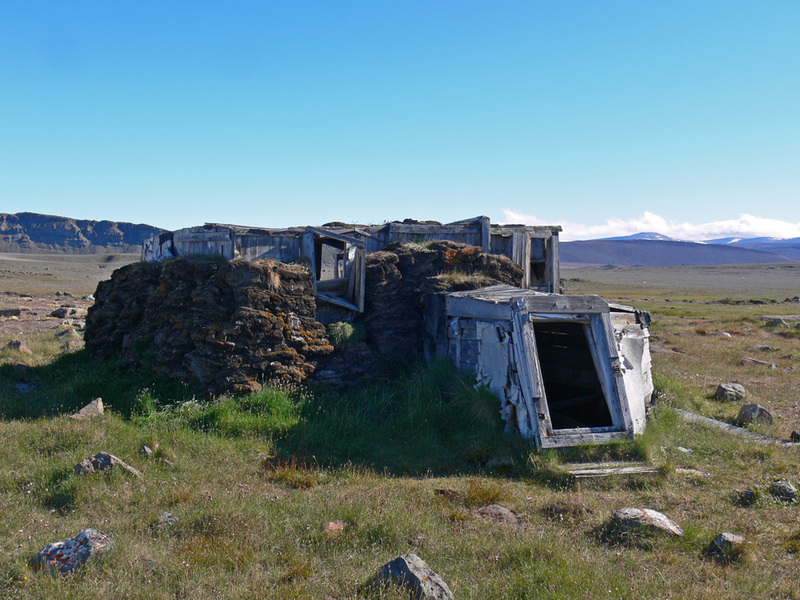 The Greenlandic name is actually “Uummannaq.” In about 1910 a mission and a trading post were established. Danes lived in the framed and painted houses and the old framed houses that used sod for insulation were for the indigenous people, the Inuit. These sod homes were a more modern version of the sod home prior to dimensional lumber and nail availability. You can see the small (and long) entrance just like an igloo or an ancient sod home. 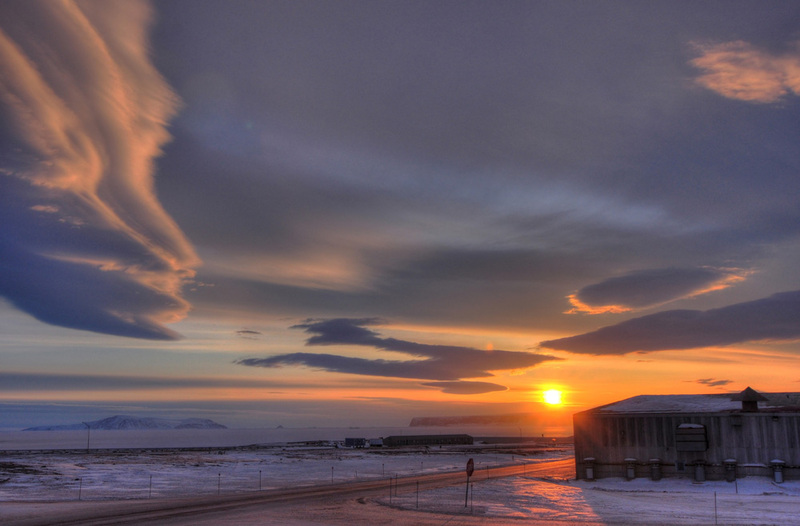 In the 1950’s when Thule Air Base was being built, the Danish government moved the people living in the village north to Qaanaaq and other established villages. Now, Uummannaq is mostly abandoned. The Danish government has given the village back to the Greenland government but no one person owns the land where the houses sit. Danes and Greenlandic hunters have fixed some of the houses up for use. Currently some of the hunters are staying over there in one of the hunting cabins.